fibers under the thin keratinocyte layer. prominent at around 6-7 years old. – The marginal gingiva appears to be round and thick, which is associated with the protruded morphology of the cervical areas in the primary teeth. – The average periodontal pocket depths are approximately 1 mm for all teeth, whereas those of the maxillary primary molar regions tend to be slight deeper. – When permanent teeth emerge in the oral cavity, the gingival sulcus becomes deeper and the marginal gingivae become extremely thin. – The thickness of the marginal gingiva in children and adolescents increases to the same amount as adults by their late teens. – According to the 1989 classification, there were no descriptions of gingival diseases, whereas dental plaque-induced or non-induced gingival diseases are listed in the 1999 classification. – In addition, the term “Adult periodontitis ” was replaced with “Chronic periodontitis” based on the epidemiological data and clinical experience, in which this form of periodontitis is also identified in adolescents. – As for the periodontitis identified in young patients, the term “Early-onset periodontitis” was used in the 1989 classification, however, the term was changed to “Aggressive periodontitis “ in order to minimize potential problems with age-dependent features of classification. 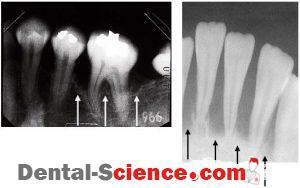 classification, which was changed to “Periodontitis as a manifestation of systemic diseases”. “Developmental or acquired deformities and conditions” were implemented. 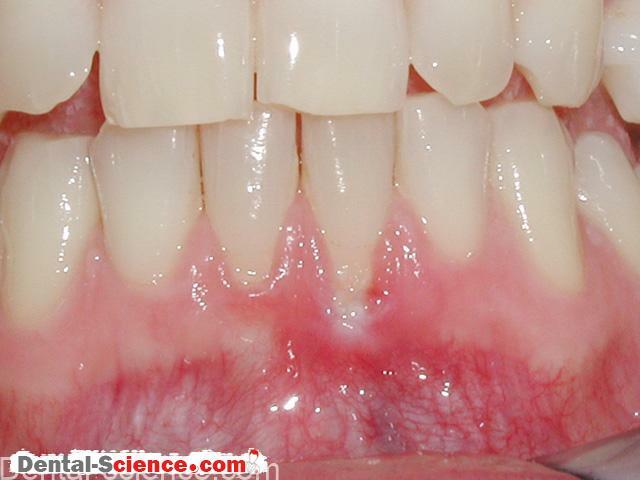 associated with systemic disease, and necrotizing periodontitis. 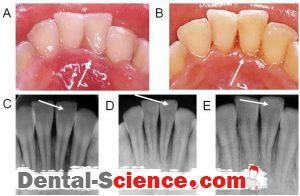 corresponding to the primary and permanent dentitions, respectively. periodontal diseases, ie.probing depth, bleeding on probing, pus discharge, tooth mobility, plaque index , and gingival index. (+) immediate bleeding on probing or (-) no bleeding. direction, and (1) slight mobility (0.2~1 mm) in a bucco-lingual direction, or (0) physiological mobility within 0.2 mm. – Pus discharge is scored as follows; (+) spontaneous pus discharge, or (-) no pus discharge. 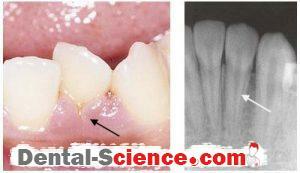 – Gingivitis is defined as localized inflammation of the marginal gingival without resorption of alveolar bone. 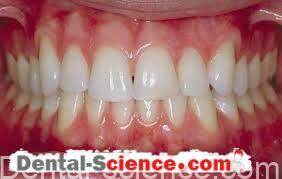 – The affected gingiva shows swelling and redness as well as ready bleeding upon probing or brushing. – All of the cases are derived from poor oral hygiene. gingivitis initiated by poor oral hygiene conditions. – The condition of the inflamed lesion is reversible in most of the cases in children, and removal of the dental plaque or calculus allows the lesions to return to the normal state. – When we encounter the cases of erupting tooth, it is difficult to maintain adequate hygiene conditions in these areas due to the difficulty of cleaning. – “Erupting gingivitis” which represents gingivitis with poor hygiene of the erupting teeth, also belongs to this category. – The incidence of gingivitis in children increases as they grow and reaches its peak at the age of 10-12 years, which we specifically call “Pubertal gingivitis”. – This gingivitis is often found in girls with gingival swelling and redness especially at the dental papilla. – It is likely that hormonal changes are associated with this increased susceptibility to gingival inflammation. – Thorough oral hygiene interventions can readily reverse this condition. – On the other hand, acute necrotizing ulcerative gingivitis (ANUG) is a rare condition in Japan although the incidences in developing countries are reported to be high. ulcerative lesions with the morphology of a crater. – The ulcerative lesion is gray and covered with a pseudomembrane which is easily removed and even a slight stimulation is known to cause severe pain. – At the initial stage, systemic antibiotics rapidly reverses this condition. – The lesion should also be differentiated from viral stomatitis. It should be noted that cases with herpetic gingivostomatitis are occasionally encountered in infants and children. – The severe inflammation, such as swelling, redness, erosion, is identified with specific foul breath odor. – At the initial stages, severe fever is observed, whereas it is generally cured within 2 weeks. water as well as nutrients are very important for healing the lesions. – Periodontitis is defined as the disease leading to destructionof periodontal tissues, such as the periodontal ligament, cementum and alveolar bone. 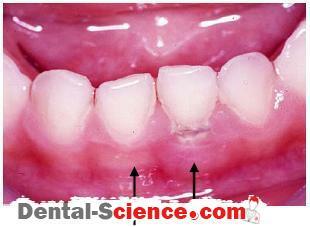 – Periodontitis in children is generally regarded as an extremely rare finding. severe redness and swelling due to the intensive inflammation. – Although the incidence is extremely low, early exfoliation of primary teeth is prominent. – Antibiotics therapy is carried out to stabilize the lesions in acute inflammation to prevent the lesions progressing gradually leading to the spontaneous exfoliation of the affected teeth. mobility of the several limited teeth. – The repeated acute attacks develop into progressive alveolar bone loss. – The inflammation can be observed only during the period of acute attack and no abnormal findings can be seen in periods without acute inflammation. 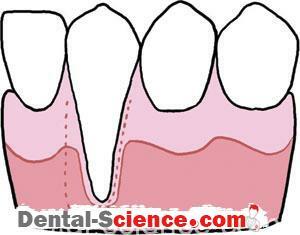 – The incidence is considered to be higher than localized juvenile periodontitis. – It should be noted that this category does not include cases of hypo-phosphatasia associated with problems in the generation of periodontal ligaments. – In order to preserve the affected teeth as long as possible, thorough oral hygiene instruction and local application of antibiotics are performed. – Localized juvenile periodontitis (LJP) is widely known as the specific form of periodontitis identified in adolescents. – The detection frequency of LJP in Japanese adolescents is reported to be 0.06-0.2%. – The vertical alveolar bone resorption is found predominantly in the first permanent molars and central incisors and is identified in females more frequently than in males. – Early diagnosis and intervention are required since the speed of the resorption of alveolar bone is very fast. – Thorough mechanical teeth cleaning and local application of antibiotics enables control of disease development. – Gingival recession is occasionally identified at the labial gingiva of mandibular incisor teeth, which is dislocated out of the dental arch due to space limitations. – In order to solve this problem, the affected teeth should be moved within the dental arch for the former case and instruction for appropriate tooth brushing for the latter case. – Gingival fibromatosis is a rare overgrowth associated with increased levels of mature collagen and the enlarged gingival tissues are usually normal in color, firm in consistency, painless and occasionally nodular with little inflammation. – Gingival fibromatosis causes esthetic and functional problems, such as malposition of teeth, prolonged retention of primary teeth and delayed eruption of permanent successors. – In addition, the hyperplastic region produces conditions favorable for accumulation of dental plaque causing secondary inflammatory changes although alveolar bone is not affected. 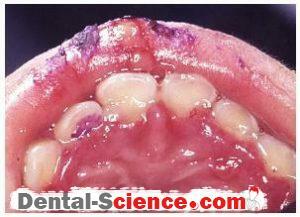 – Gingival fibromatosis is known to have hereditary predispositions in some patients. medication, such as phenytoin,commonly used as an antiepileptic, can lead to the onset and development of the lesion. – Furthermore, cyclosporine, an immunosuppressant drug, and nifedipine, a calcium channel blocker used as an antihypertensive agent, are also known to cause similar gingival overgrowth. – Phenytoin is known to stimulate responsive subpopulations of gingival fibroblasts to accumulate extracellular matrix components, resulting in gingival overgrowth, whereas several studies have found a relationship between the quantity of accumulated dental plaque and phenytoin-induced gingival overgrowth. – It was also recently indicated that dental plaque accumulation is the most important determinant of phenytoin-induced gingival overgrowth. – Therefore, it is now believed that enhanced matrix synthesis by fibroblasts responsive to phenytoin can be triggered or enhanced by chronic inflammation due to dental plaque. – In general, professional teeth cleaning and tooth brushing instruction are performed and gingivectomy is carried out for severe cases although recurrence of the lesion is often observed. – A 10-year-old girl was referred to our clinic for consultation due to the swollen gingiva in her incisor regions that caused esthetic problems. maxillary and mandibular teeth, which covered almost half of the crown. – Gingivectomy was carried out under local anesthesia, which solved her esthetic problems. 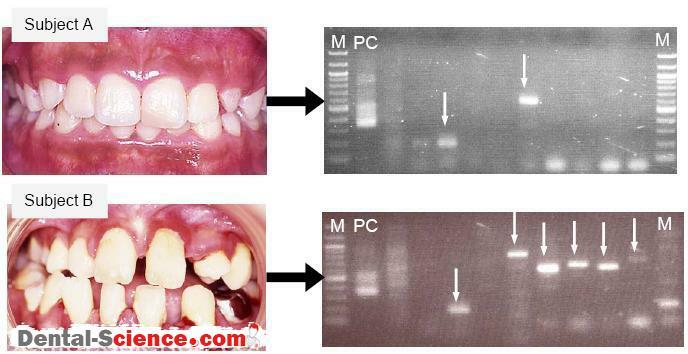 – Histopathological analyses showed the typical appearance of gingival fibromatosis. – There were no recurrences of the lesion reported in this case. overgrowth, which should be periodically monitored. – Acute periodontitis is not listed in the classification now used in the field of periodontology. development in a couple of days are described in the oral pathology literature. – Appropriate interventions enable recovery to healthy periodontal conditions for several months. 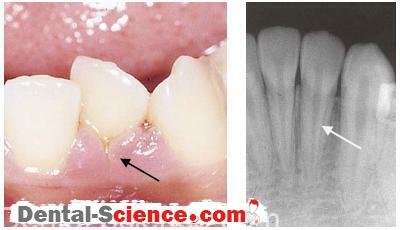 bacteria at the sites of small injuries present in the gingival sulcus. – Although rarely encountered, irrigation of the gingival pocket and systemic antibiotic therapy generally suppress acute inflammation within a week. mobility in her lower permanent incisors. resulted in a significant improvement of the clinical parameters. alveolar bone in the affected tooth. – It is of interest that microbiological examinations at the first visit did not identify any typical periodontitis-related pathogens, whereas several periodontitis-associated species were identified in the examinations held after the healing of the lesions. – Orthodontic bands could also be one of the possible initiators of acute periodontitis. occlusal pain around the mandibular left permanent molar. 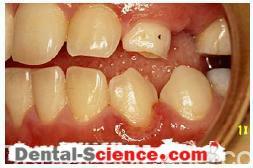 – The maximum periodontal pockets depth was 9 mm and the affected tooth showed severe mobility. – According to the orthodontist, the orthodontic band was removed just before visiting our clinic. – Periapical radiograph showed alveolar bone loss on the distal side. – Irrigation of the marginal gingiva with systemic antibiotics was performed. – Twelve days later, inflammation of the affected gingiva had diminished and the maximum periodontal pocket was reduced to 6 mm. materials fitted to the teeth, such as small plastic tubes, are accidentally inserted into the tooth crown and cause attachment loss. – In our clinic, only 4 cases have been encountered over a period of approximately 40 years, all of which were accidentally induced by the insertion of plastic tubes into the lower primary central incisor region. – In 3 of those, a single plastic tube had been inserted into the left lower primary central incisor area, whereas 2 tubes were found simultaneously in the dental cervix of the lower primary central incisors. 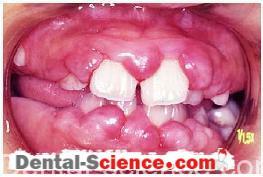 – A 4-year-old boy was referred with the chief complaint of swelling around his lower primary incisors. 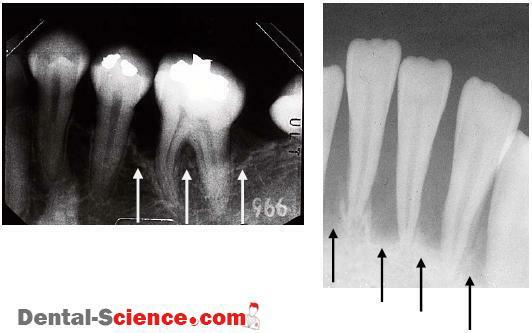 – A periapical radiograph revealed diffuse alveolar bone loss between the lower primary central incisors. – Irrigation of the affected teeth was performed. – Table 3 summarizes the transitional changes in his periodontal health. central incisors were being repaired. – It was concluded that the type of periodontitis caused by such an incident is not progressive, unlike other periodontal diseases such as prepubertal and juvenile periodontitis. periodontitis in children is identified in certain types of systemic diseases mainly due to the impairment of the host immune response. – It is well known that patients with neutropenia, Chédiak-Higashi syndrome, Papillon-Lefèvre syndrome, Down‘s syndrome, diabetes mellitus, hypophosphatasia, Histiocytosis syndrome, Ehlers-Danlos syndrome, and acquired immunodeficiency syndrome, are prone to develop periodontitis. 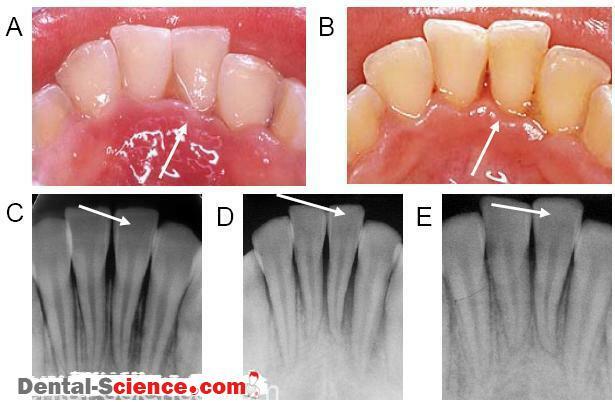 associated with the impaired activity of tissue-nonspecific alkaline phosphatase, and the disease is highly variable in clinical expression, ranging from an almost total lack of skeletal formation to the premature loss of the permanent anterior teeth. accumulation of bacteria accelerates the exfoliation. impairment due to a low alkaline phosphatase concentration. – It is difficult to prevent the early exfoliation of the primary incisors although only a limited number of teeth, mainly mandibular anterior teeth, are affected. – In addition, it is extremely rare to observe cases with early exfoliation of the permanent teeth. – Local antibiotic irrigation and professional tooth brushing instruction may lead to modulation of the exfoliation period. primary lateral incisor was missing and exposure of the root of the mandibular right primary canine was prominent. – In contrast, there were no specific problems in the younger brother although one tooth was missing due to a previous traumatic injury. performed, while brushing instructions were given to the patient and his parents to prevent progression to tooth exfoliation. – Periodical examinations were carried out and 2 additional teeth were found exfoliated in the elder brother. – At 5Y3M, there were 15 teeth identified in the elder brother, while 19 teeth were identified in the younger brother. – Although cases with twin brothers are considered to result from genetic influences, their teeth phenotypes were totally distinct. – A tooth with a radicular gingival groove is considered to be susceptible to periodontitis due to the weak binding of periodontal ligaments to the root surface. a reported prevalence of 2-4%, with the maxillary lateral incisors regarded as the area with the most frequent occurrence. produced by a vertical tooth fracture. – Nevertheless, the prognosis for the lesions is considered to be poor. – An 11Y5M female came to our clinic with a chief complaint of severe gingival inflammation in the mandibular left lateral incisor. derived from the radicular gingival groove. – After a long interval between examinations, she returned to our clinic at the age of 18Y4M and reported repeated slight swelling that had occurred for several years, although without severe signs or symptoms. – We rationalized that the lesion is susceptible to inflammation due to her anatomical anomaly, however, careful oral hygiene possibly stabilized the lesion. between 6 and 9 mm, which are regarded as severe conditions. – Prognoses are considered to be poor and extraction of the affected teeth was reported in most of the cases in a range of 6 months to 3 years, while no significant recurrent signs or symptoms were observed for 1.5 to 3 years in several of the cases. – Thus, periodical observation is important once we identify teeth with radicular-gingival grooves in order to intervene in the onset and development of periodontitis.